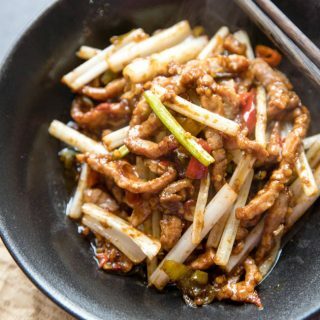 Szechuan beef shreds or Szechuan style beef stir fry is a very popular and common Sichuan style stir fries which creates extremely delicious and hot flavors. 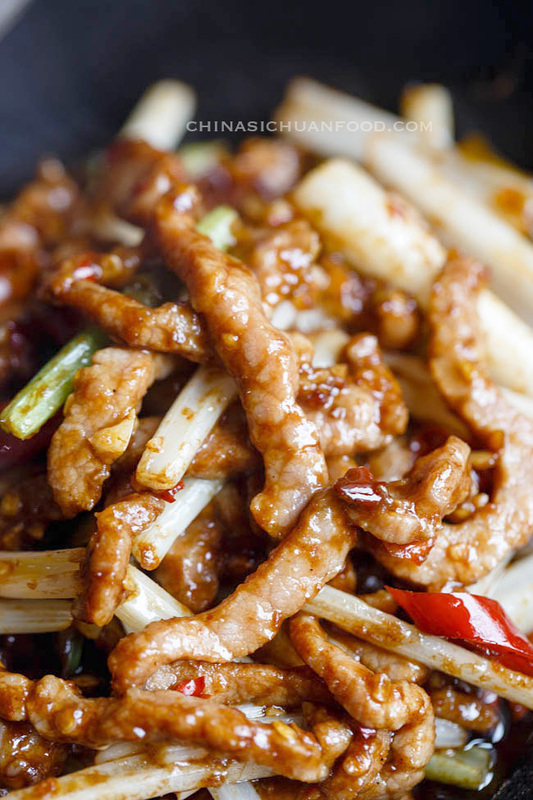 There are actually two famous beef dishes in Sichuan cuisine. One is this savory tender beef stir fry and the other one is dry fried shredded beef with spices (干煸牛肉丝). 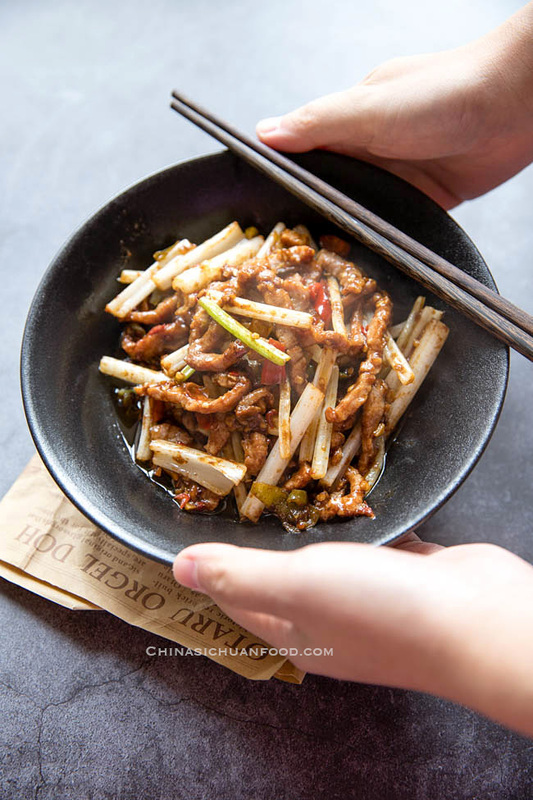 In our local Sichuan dish chain store (similar to KFC, but providing very basic and common Sichuan dishes), this Szechuan style shredded beef is a must part of a whole meal. Shredded beef is served with any other ordered dish, like chicken, meatballs and steamed rice to form a very typical Sichuan working day lunch. Through it is not famous outside China, try it at once. 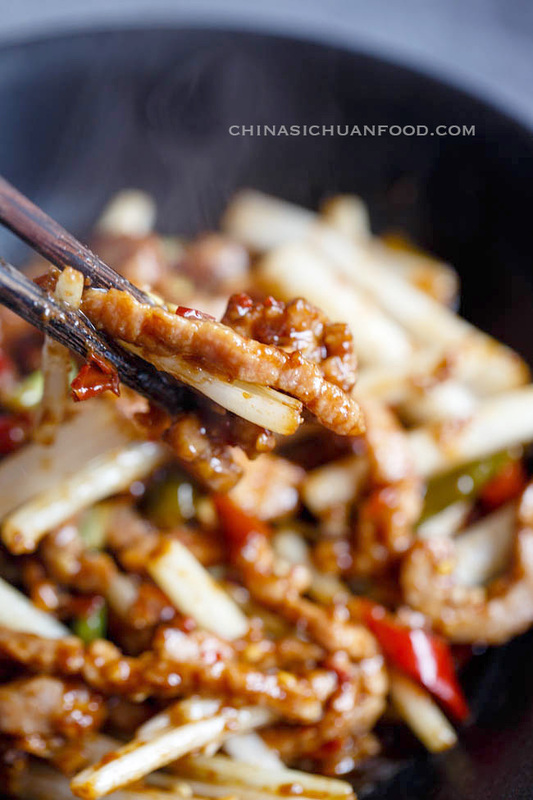 Believe me, it is as good as your favorite kung pao chicken. 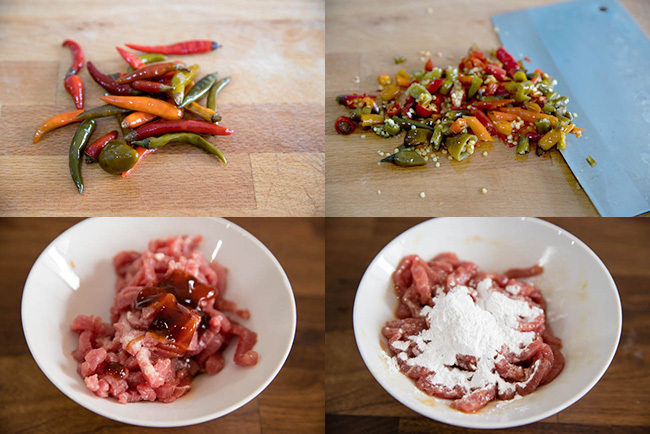 The basic ingredients for an authentic Sichuan style stir fry. 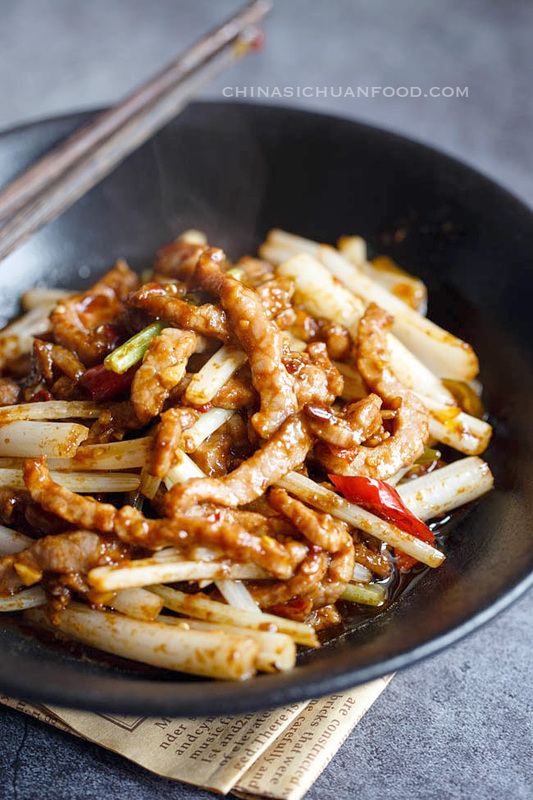 Doubanjiang is a famous Sichuan chili paste made from fermented broad beans and fresh peppers. It provides a very mild and yummy spice flavor. Pickled peppers (泡椒) is another underrated star of Sichuan cuisine. They are almost only popular in Sichuan cuisine in China as seasonings. We love to use them in stir frying dishes or make stews. 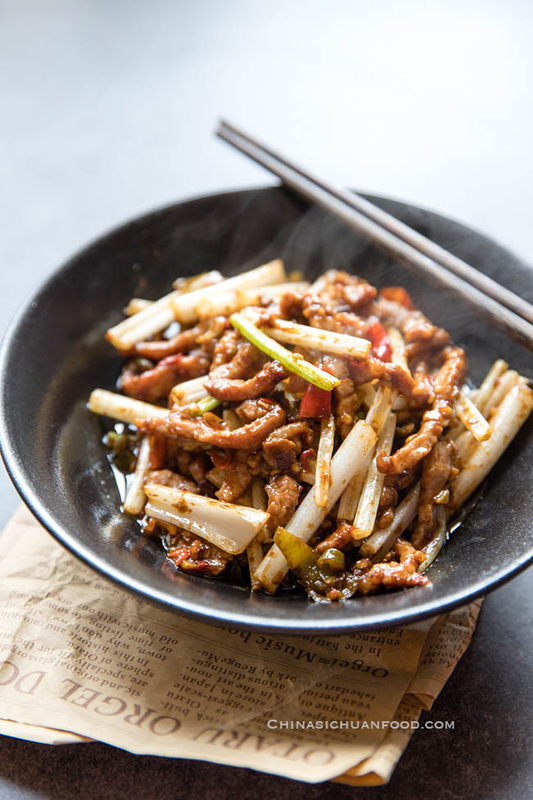 Sichuan pickled peppers are naturally fermented with the help of Lactic Acid Bacteria and consequently help the final dish to obtain a slightly sour taste. You can learn how to make authentic Sichuan style pickled peppers from this post or refer to this shortcut pickled peppers. If you cannot get pickled peppers, you can use 4-5 fresh peppers and add black vinegar to imitate the flavor. I the picture, I show you the magic ingredient of this recipe — pickled peppers. Chop pickled peppers into small pieces. Cut the beef against the grain into thin slices. Then cut into shreds. Mix the beef with all the seasonings expect cornstarch. Marinating for 15 minutes. Then mix cornstarch in. Mix well. Add around 1 tablespoon of cooking oil in wok and fry celery for 1 minutes until just cooked. To avoid overcooking the beef shreds. Heat the wok until hot firstly. Then place 1 tablespoon of oil and add garlic, ginger, scallion and pickled peppers. Fry until aromatic over slow fire. Do not burn them! Push all the content in the wok to one edge of the wok, add another 2 tablespoon of cooking oil in center and spread the beef shreds in. Gently fry. When the beef begin to change color on surface, place 1 tablespoon of doubanjiang in. Add dark soy sauce, celery and salt if necessary. Mix well quickly. Serve hot! Cut the beef against the grain into thin slices. Then cut into shreds. Mix the beef with all the seasonings expect cornstarch. Marinating for 15 minutes. Then mix cornstarch in. Mix well. Add around 1 tablespoon of cooking oil in wok and fry celery for 1 minutes until just cooked. Heat the wok until hot firstly. Then place 1 tablespoon of oil and add garlic, ginger, scallion and pickled peppers. Fry until aromatic. 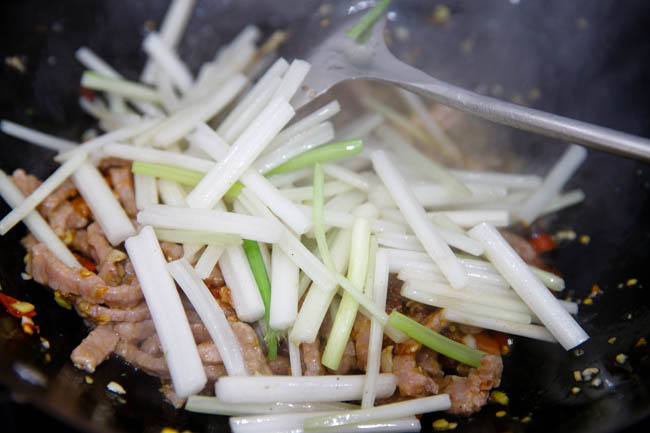 Push all the content in the wok to one edge of the wok, add another 2 tablespoon of cooking oil in center and spread the beef shreds in. 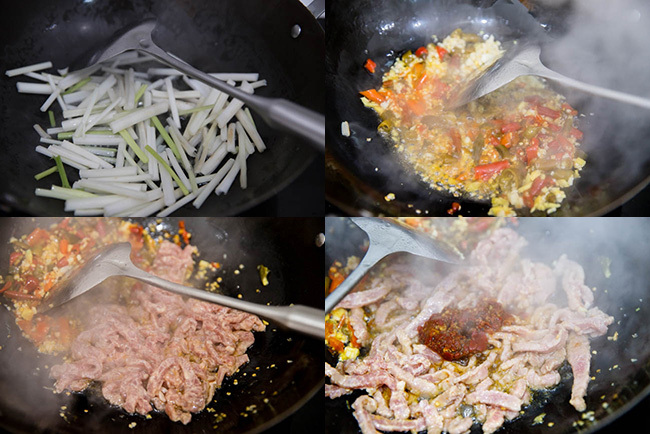 Gently fry When the beef begin to change color on surface, place 1 tablespoon of doubanjiang in. Add dark soy sauce, celery and salt if necessary. Mix well quickly. Serve hot! If you cannot get pickled peppers, use fresh chopped peppers. But the amount of fresh peppers should be halved. Otherwise, the final dish might be overwhelming spicy. In order to create a slightly sour taste, add around 2 teaspoons of black vinegar along with dark soy sauce.